USAopoly will release two new licensed versions of Talisman in North America and other select regions later this year. This will be the first time a licensed version of the game will be available. The new partnership grants USAopoly international rights to distribute co-branded renditions of the "Magical Quest Game" via distributors, online marketplaces and beyond. "Talisman is one of the most respected table top games of all time and served as a gateway into gaming for many people," Candace Brenner, VP of Marketing for USAopoly. 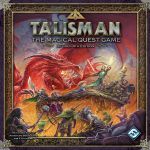 "Working with some of the most cherished licenses in the world to add our own heroic twists to the game, these upcoming thematic versions will let an entire new audience experience the grand adventure that is Talisman!" First released in 1983, Talisman has sold millions of copies worldwide. The game's fourth edition, which was released in 2009, was granted the Ludoteca Ideale Official Selection award. Regarding that final paragraph, each year at NY Toy Fair I visit the USAopoly booth and see many things that I can neither photograph nor write about due to embargoes on information related to the licensed properties involved. Why visit then? To stay on top of what's coming and to put those titles in context with everything else that I'm seeing. I like trying to grapple with trends in the industry, and developments like these have a role in shaping and reflecting those trends.